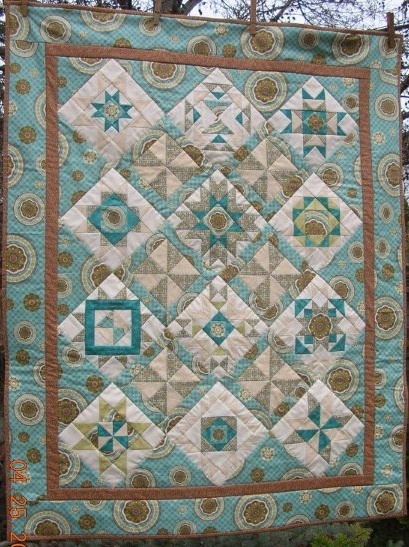 Cotton and Chocolate is a wonderful quilt shop located in Thousand Oaks, California. Voted one of the Top Ten Shops by Quilt Sampler Magazine in 2012, this shop does some amazing things. I visited their booth at QuiltCon in Pasadena last February, and their samples were jaw-dropping! I’m mentioning them here today because . . .
For their Saturday Sampler Club in 2017, they are doing the Hazel’s Diary quilt!! And today is the sign-up day! So if you’re anywhere near Thousand Oaks, get yourself to the quilt shop and sign up! If Cotton and Chocolate happens to be your local quilt shop, then consider me jealous. They’re limiting enrollment to 100 spots, and you can read all the details in their latest newsletter from their website. I’ll be following their progress all year; I’m so excited to see their quilts! I’m here today to highlight a participant from the very first Hazel’s Diary Quilt-Along, the 1951 Quilt. 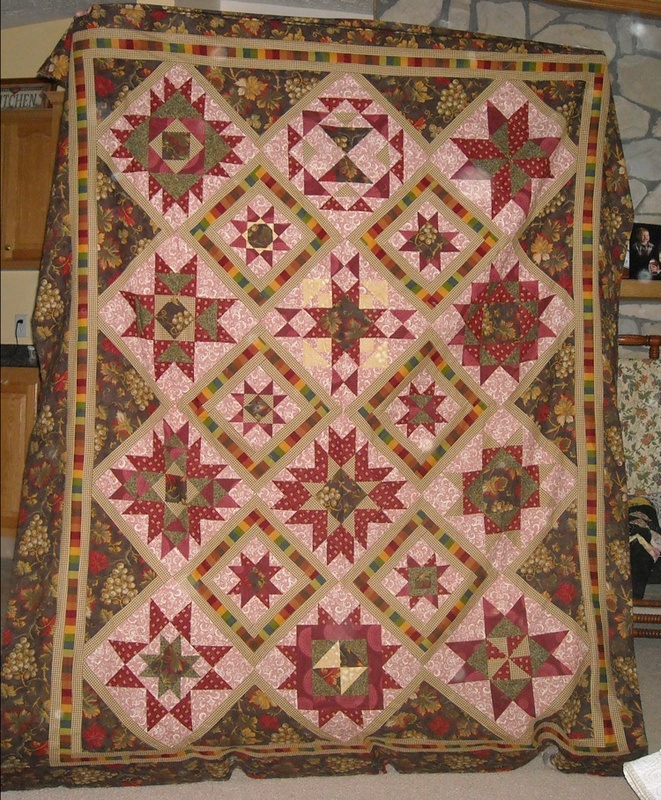 Susanne contacted me a few days ago to let me know she had finally finished her quilt. And it’s fabulous! I’m always so thrilled to see yet another colorway and someone else’s take on the pattern, and Susanne used a wonderful zebra print in her quilt — along with all the bright colors in her blocks, it just zings . . .
Susanne blogged about her quilt, and you can go read all about it and see some more pictures by clicking HERE. 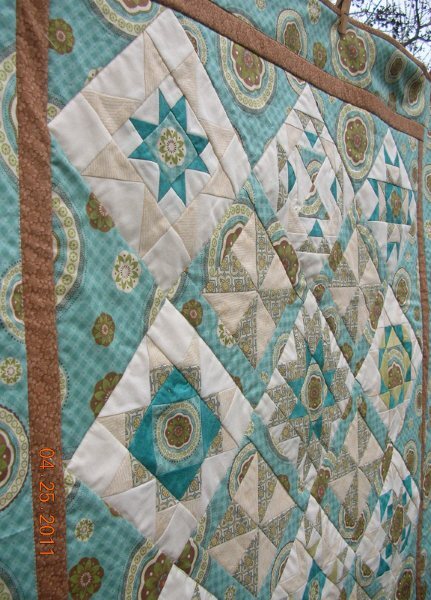 And thank you so much, Susanne, for sharing the post and pictures with us — your quilt is beautiful! 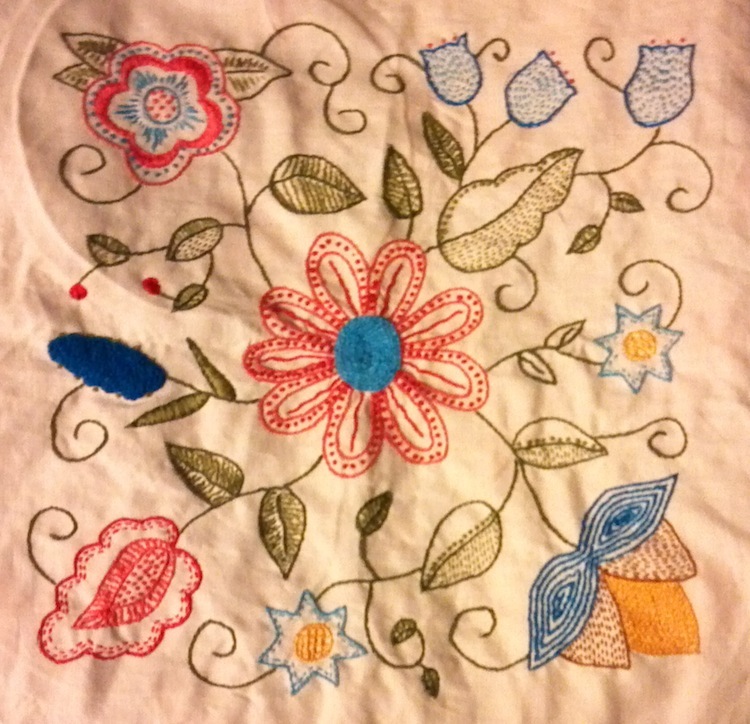 I’ve received several pictures from participants of their finished blocks, which always makes me happy. 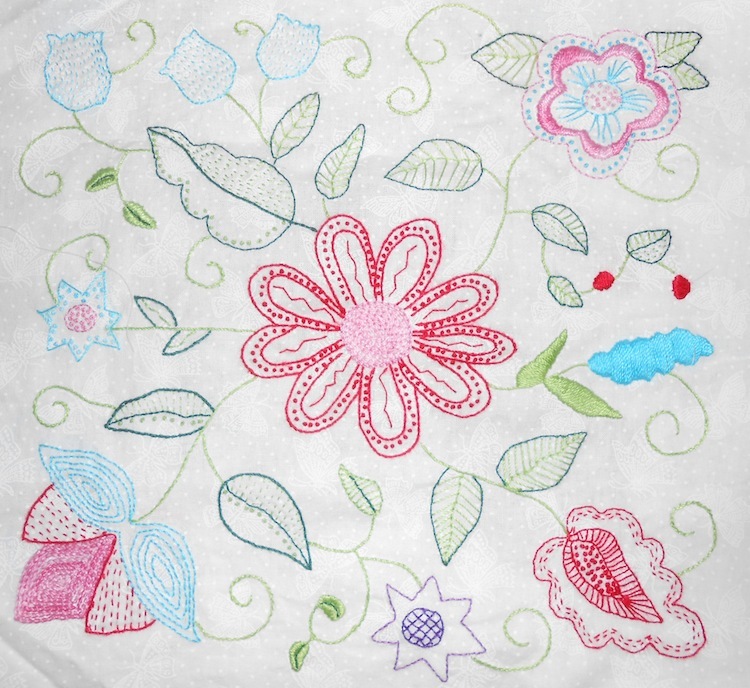 It’s great to know that you are all quilting along with me and that you actually like the project! I’m hard at work getting Block 4 ready to post. This requires equipment to be working properly, being able to find everything, and most of all, a little bit (OK, a lot) of concentration and focus on my part. Never has my ADD been more annoying to me than since we made this last move. I cannot believe how one little thing can so quickly lead me to something else, and on and on and on, until I’ve done nothing but follow rabbit trails all day and accomplished nothing at all! Anyway, while you’re waiting for Block 4, which I’ll have ready in just a few more days, I thought I’d show you some pictures of what your fellow Quilt-Alongers have gotten done. 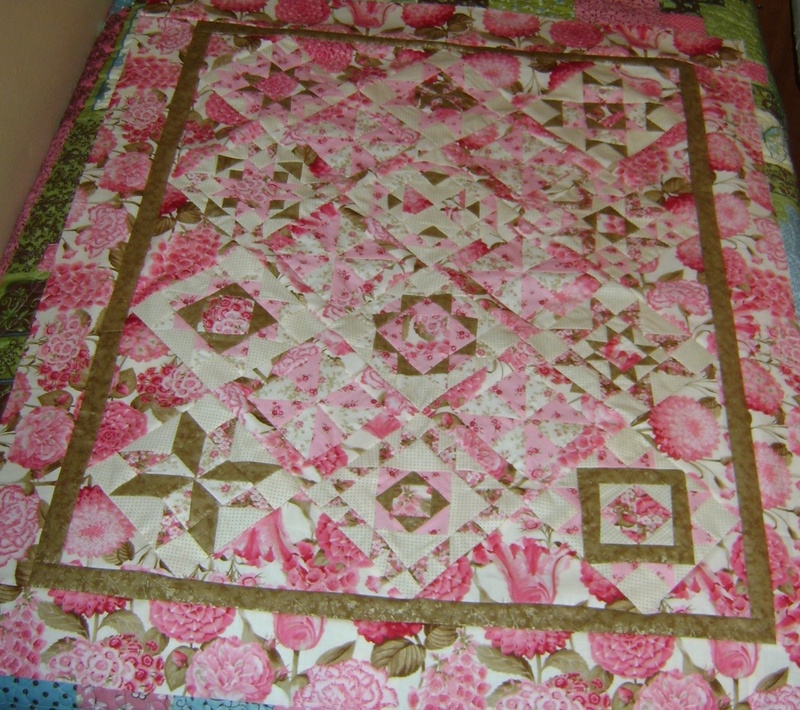 You can see more pictures and lots of close-ups of Stephanie’s block by clicking HERE. I just love seeing all the color and stitch choices everyone is making! If you have pictures of your finished blocks to show and would like to share them, just send them along to me, and I’ll keep doing these periodic posts to feature them. And thanks to those of you who have sent them so far! Are you all ready for Block 4? I’m so impressed with you guys in this quilt-along so far. You’ve been so kind to send me pictures of your finished blocks. I absolutely LOVE seeing all the different colorways. I just have to show them to everyone. Here’s Kay’s Block 1. 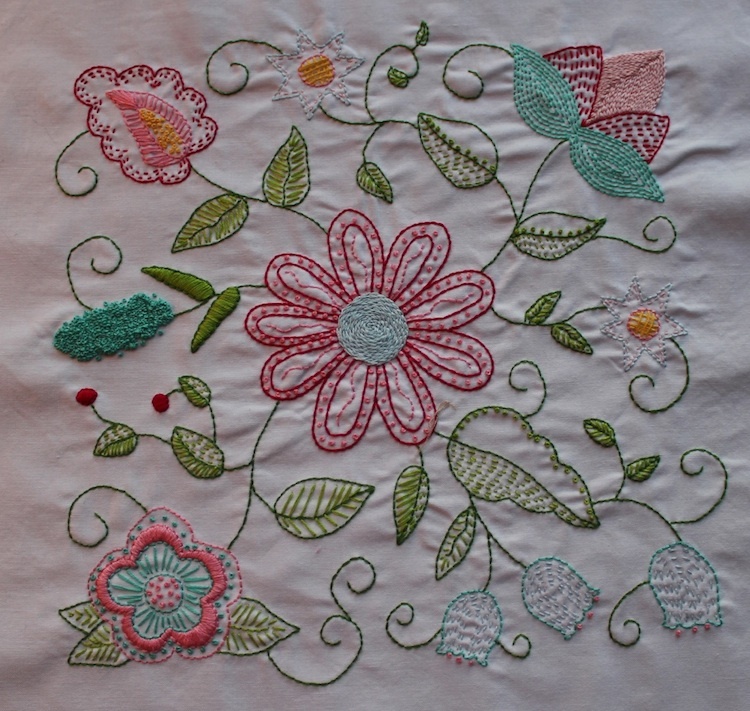 She’s using a Sulky variegated thread for at least the blue part, and I love the way it made her French knot flower look. I love the soft palette of this one. Here’s Kathy’s Block 1. I’m loving the purple and orange together. You can see a little snippet of her fabric at the edges that she’s pulling her colors from. Fabulous! Here’s Diane’s Block 1. The bright blue is wonderful! I haven’t seen Diane’s fabric choices, but this is sure making me wonder what they are! It can only be gorgeous, if this is any indication. Here’s Stephanie‘s Block 1. She and I must be twins separated at birth — we’re crushing on the same color palette lately. She added some yellow into hers. She’s also posted lots more photos and close-up shots of her block on her own blog. You can click HERE to see those. Thanks, ladies, for sending me the pictures. I can hardly wait to see what you do with the rest of the blocks, and what your finished projects turn out like! If you’ve finished a block and want to send me pictures, I’ll be thrilled to post some more. I know Marge has one almost done, in gorgeous colors, and my friend, Rose Marie, is doing bluework on hers in the most vivid blue imaginable. I also know my sister is making one, but she won’t show me hers — she’s being all secretive and crap — makes me wanna beat her. I’ll be back with more news tomorrow, and possibly even that Alternate Project for Block 2 that I promised a while back. Block 3 is scheduled to come out next Monday, too, so all this should keep you busy! I know it’s keeping ME hopping! It’s time once again for another Featured Participant. This time I’m introducing you all to my best friend, Rose Marie. She obviously had no choice but to join in the Quilt-Along! 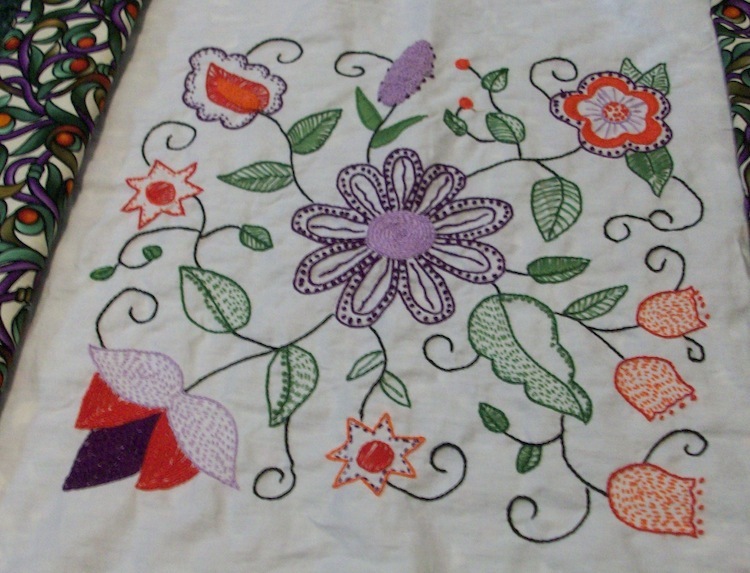 I asked Rose Marie to tell us how she came to be a quilter . 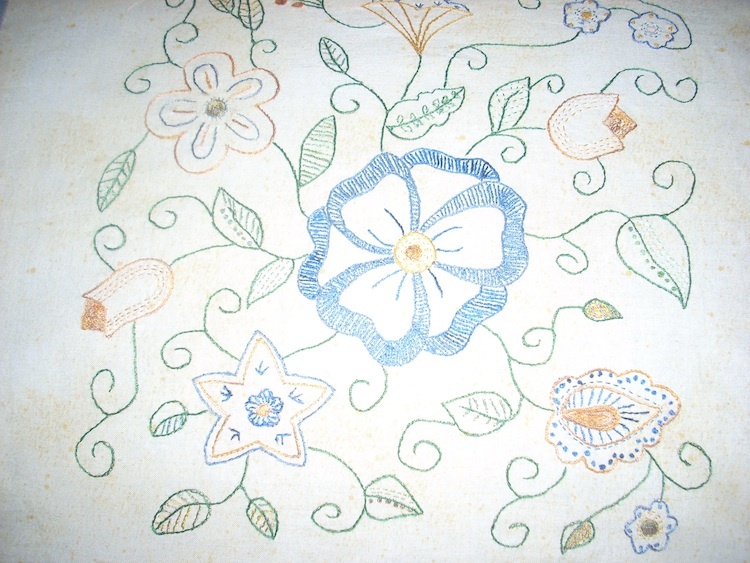 . .
Rose Marie took to quilting like a fish to water, and I wondered where she considers herself in her quilting journey, given all the different things she’s tried just since I’ve known her. I really don’t think Rose Marie is on the downhill side of anything. 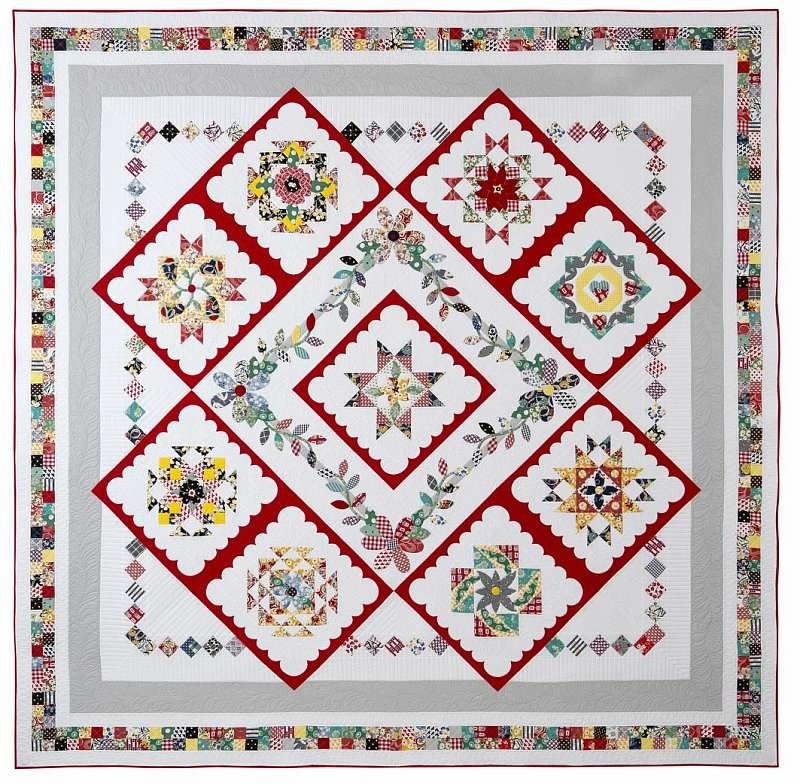 She DID have a quilt accepted into the AQS Show in Des Moines, and there was no foul about it. You can see that quilt HERE. She adds, “I’m glad I did because the quilt is wonderful, although I did have to go to the creator of the Quilt-along for help. But she can tell you that I often challenge the most able teachers.” That is true. In fact, we have an agreement that she is not allowed in any of my quilting classes! When questioned about where she got the fabrics for her Quilt-Along quilt, she confesses, “I used what was in my stash and had to substitute about 1/4 yard into a few of the blocks because one piece I used was actually a little too small.” I would have been completely shocked if she had thought she needed to go shopping for this quilt. I’ve seen her stash! Aren’t her choices great? I know she had one spot of trouble making the quilt, and I take the blame for it because others have said the same thing. It’s Setting Block 5. I drug it out entirely too long, and it caused folks to get a little lost. Rose Marie says of it: “One of the setting blocks could be labeled as the block from hell . . . or maybe I am just the participant from hell.” Haha! No . . . Thanks, Rose Marie, for being a Featured Participant, altho, once again, you didn’t really have a choice! I’m way overdue for featuring another participant. But finally I’m back, and this time, we’re hearing from KarenC. 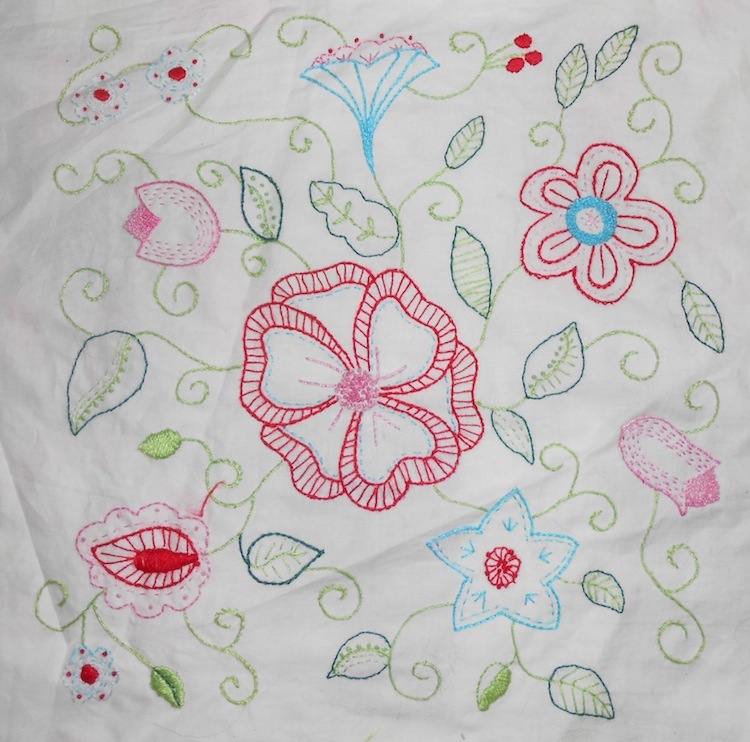 Karen begins by telling us, “I’ve always loved fabrics and needle work of any type, thanks to my Mom. She is very talented in the needle arts. 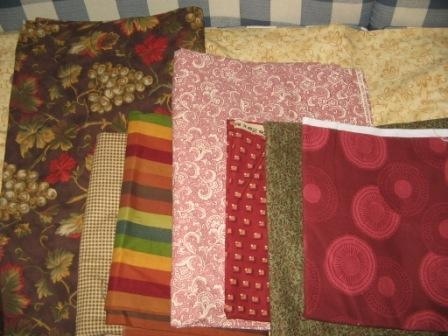 Her Mom was a quilter so I grew up with her lovely quilts in our home. 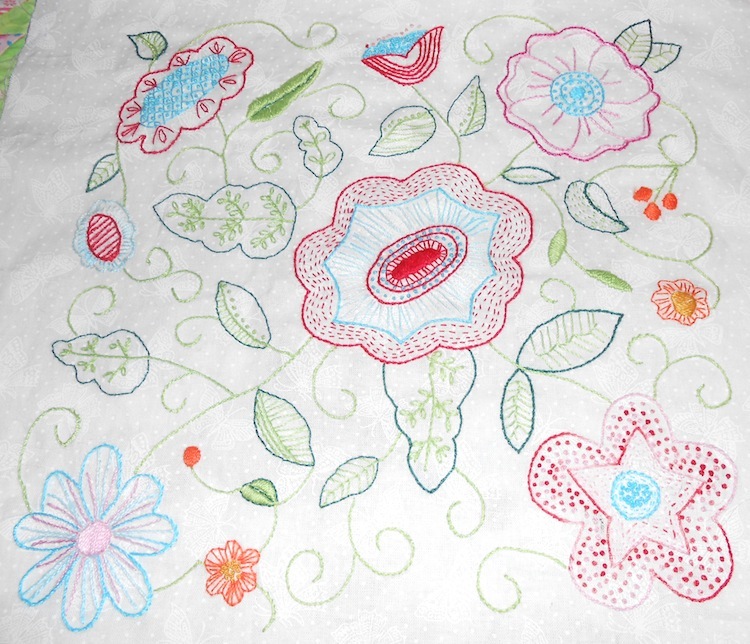 I’d always wanted to learn about quilting but it wasn’t until 2008, when I was pregnant with my daughter, that I decided to teach myself. So I started with a little patchwork taggy blanket. Then I eventually found quilt-alongs on the internet and figured this was the best way to teach myself. 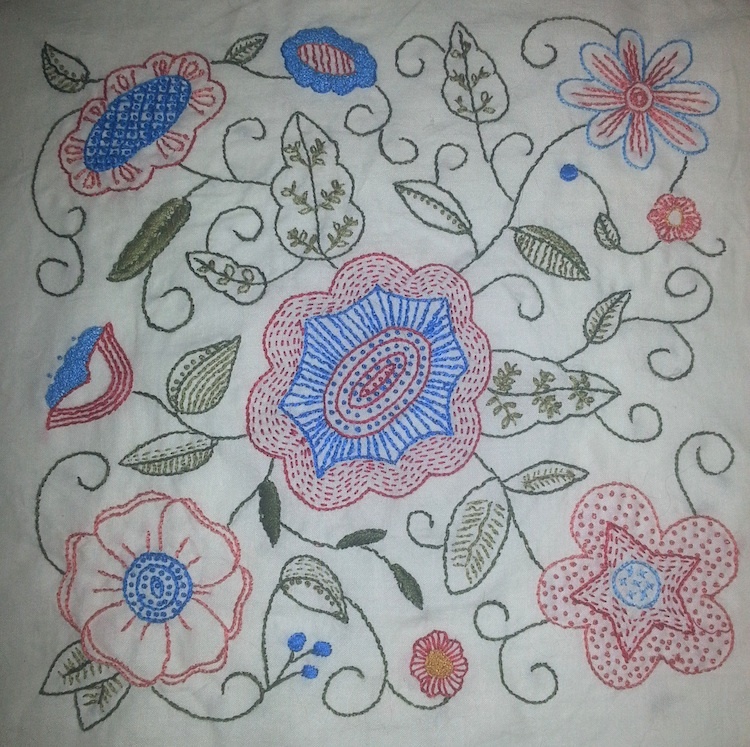 After doing this quilt-along, I finally think of myself as a quilter, because I learned so much from it. Karen had never tried a mystery quilt before, but says she was glad this one was a mystery, “because if I’d seen the finished quilt, I’m sure that I would have been too intimidated to try it.” I’m certainly glad she tried it! Karen, I love your fabric selections, and I think your quilt turned out beautifully. Congratulations, and thanks so much for being a Featured Participant! 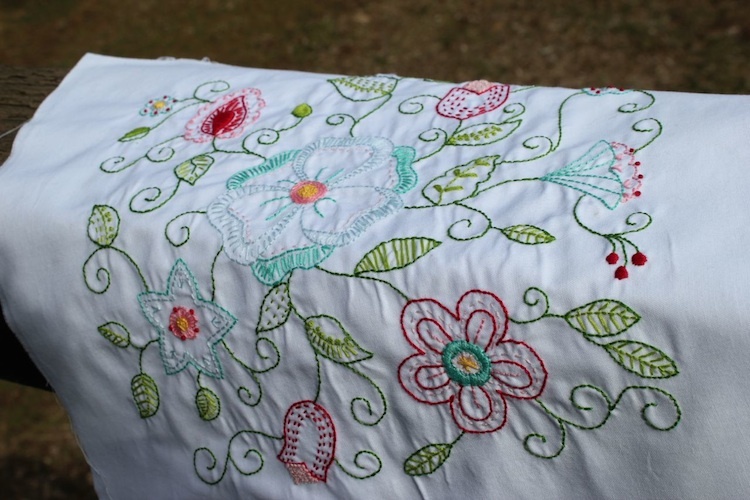 If you’d like to see more pictures of Karen’s quilt, and see what else she’s up to, just go visit her blog here: For the Love of Needle and Thread. It’s time once again for a Featured Participant. This time I’m talking to CathyP. 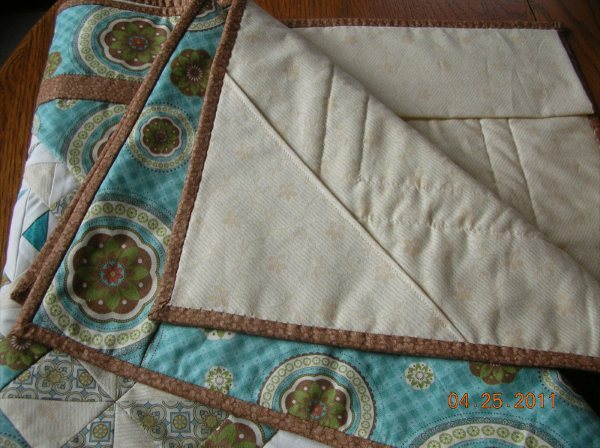 This is not Cathy’s first mystery quilt. She has previously made Bonnie Hunter’s Double Delight, and is currently working on Bonnie’s Roll, Roll, Cotton Boll mystery. 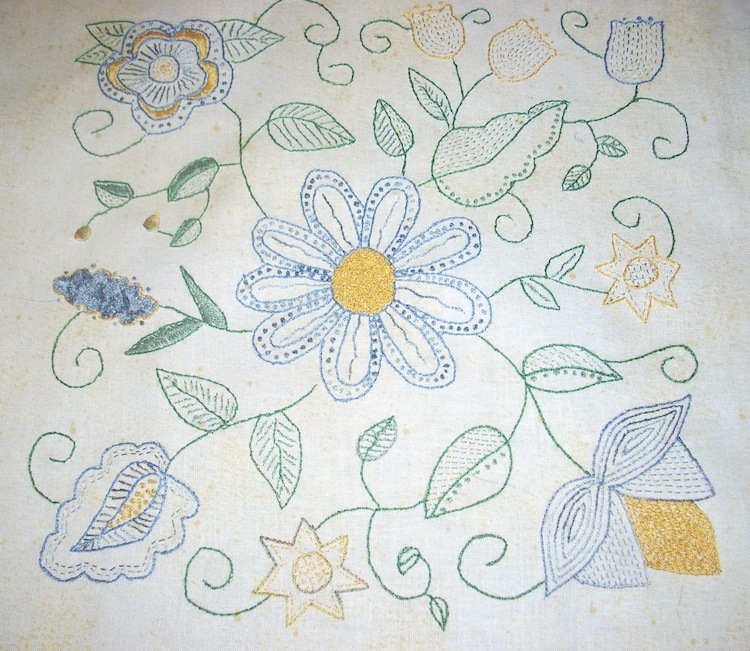 I asked Cathy why she decided to join the Quilt-Along, and she said, “I was hoping to learn some new techniques. 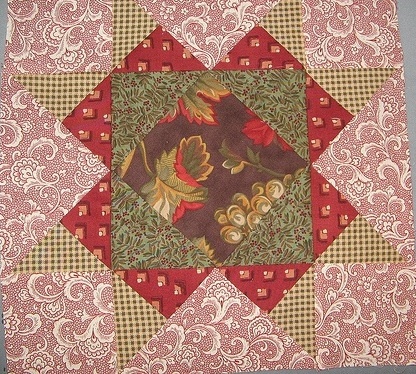 I liked the flying geese technique you taught us,” adding that she is glad she joined in on the Quilt-Along. 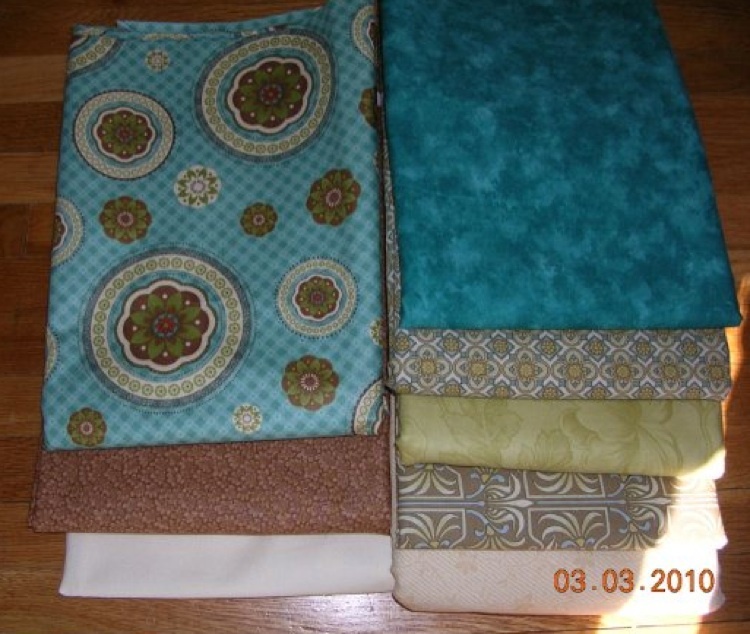 Although she said she could have found fabric in her stash to make the quilt, she instead bought fabric for this project, because, as she says, “Shopping is fun, too!” I definitely agree with that! I think her quilt turned out wonderfully. It’s got that soft blended look about it, but is also very bright and cheery. Yes, I believe it will! Thanks, Cathy, for sharing your quilt with us.